Card Cafe- what is that you ask? Well, if you have done my card buffets in the past when I had about 10 cards out and you could make as many as you want for a certain amount per card….it is kind of like that but NOT! I will have 10-15 cards in bins/bags that will have all the paper, stamps and embellishments in it to make that card. You choose your card and get the ink and blocks on the instructions and go to your seat and make that card. When you finish you return the bag/bin and blocks and ink and choose a new card and repeat for 2 hours. For up to 5 cards it is $10, for more than 5 cards it is $15. Let me know if you plan to come (just so I am sure to have enough spots set up! No need to pay until the end of the Card Cafe! This will be a monthly event. Each month there will additional new cards and some will go away. So this is one of the cards you could make! 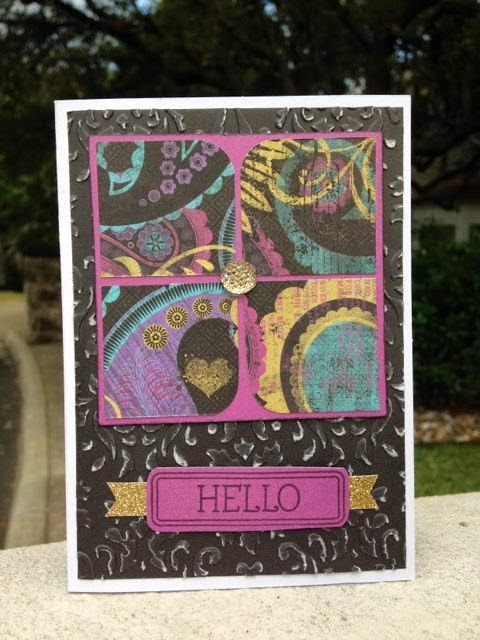 Laughing Lola for Throwback Thursday (something old) and the Damask embossing folder , Gold Shimmer Trim and Bling Gems in Gold and Hello from the Have a Happy Day stamp set are terrific new products! I also entered this card in the Southern Girls Challenge to use texture and 4 Crafty Chicks Something Old/Something New Challenge. For more Laughing Lola go here! Thanks for sharing your card with us at 4 Crafty Chicks, love the paper and the embossing you did at the back, great job! Beautiful! Love the colors!! Thanks for joining us at Southern Girls Challenge, best of luck! !